A Heart That Receives: Do You Need To Just RECEIVE From God? I’ve been in tears quite awhile today over some amazing, encouraging, HOPEFUL words from Scripture about having a heart that receives. I want to share them with you, for I believe they will touch your heart as well. I received this month’s Illustrated Faith devotional kit, A Heart That Receives, a few days ago. I review these for DaySpring every month, and I love them. Like I said last time, the Lord uses them as prophetic ministry in my life. From Holy Spirit straight to me. This month was no different. This kit is a WORD. By the way: coupon code 25FORYOU is good for 25% off everything in the DaySpring/Illustrated Faith store, PLUS free shipping, through Friday. Get it while the gettin’s good! Why did this kit touch me so deeply? Because I’ve been taking part in a prayer-and-accountability group about physical health. The group is from my friend Gail Dudley, and the Lord has been talking to me about RECEIVING His help to get fit and lose weight. … And Papa started cleaning my clock right away out of Romans chapter 5, telling me about grace and His help. Then, as if that weren’t enough, Father started showing me things about myself–thought patterns I need to get cleaned up that have impacted my health and weight. It’s been SO healing and encouraging, and I am going to share some of those things with you at a later time. But for now, back to receiving. 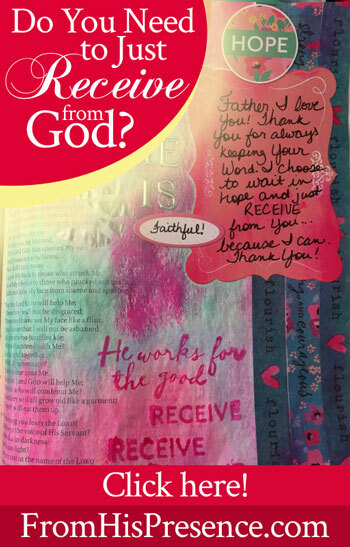 I got this Illustrated Faith devotional kit in the mail, and I absolutely laughed … because RECEIVING has been what’s on Papa’s heart for me anyway, even before I knew what this kit would be about. So I want to share some precious thoughts from Abba Papa that I believe will encourage you. These are things that Father spoke to me as I was working through this devotional kit. 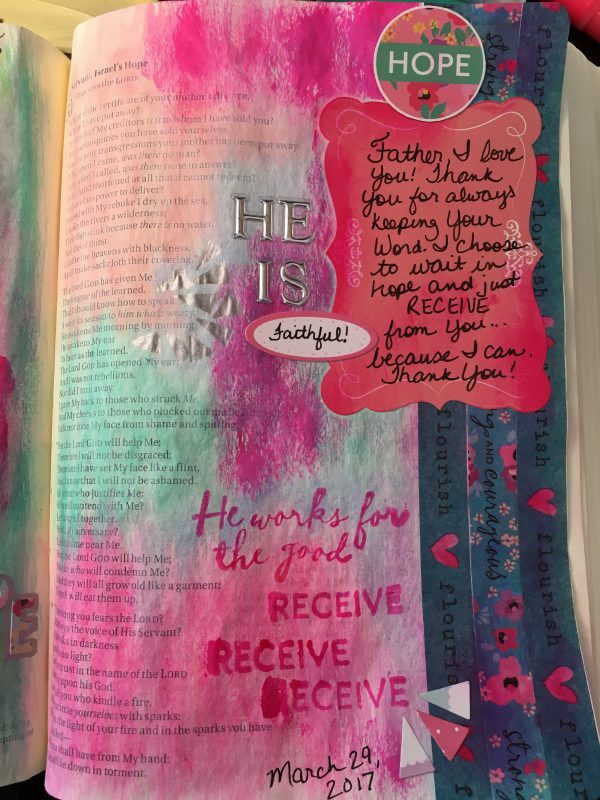 So, to give credit where credit is due, I want to tell you all about the “A Heart That Receives” kit from the good folks over at DaySpring and Illustrated Faith. The “A Heart That Receives” kit comes with a 14-day devotional kit, stamps, die-cuts, stickers, alphabet stickers, and more. 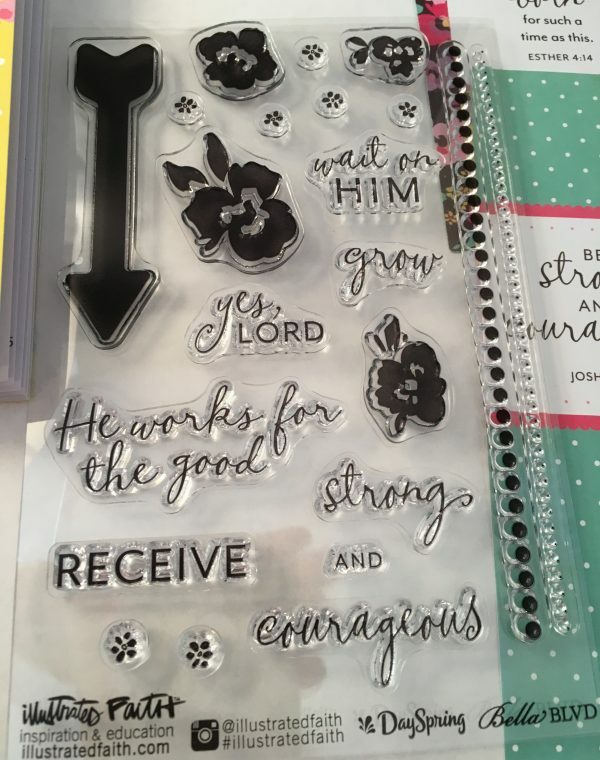 Die-cuts from the DaySpring “A Heart That Receives” Illustrated Faith devotional kit. Click the image to visit the Illustrated Faith store. 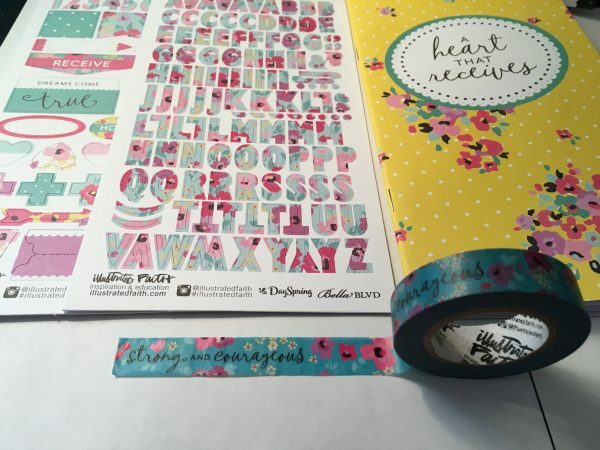 Devotional kit, washi tape, and stickers from the DaySpring “A Heart That Receives” Illustrated Faith devotional kit. Click the image to visit the Illustrated Faith store. 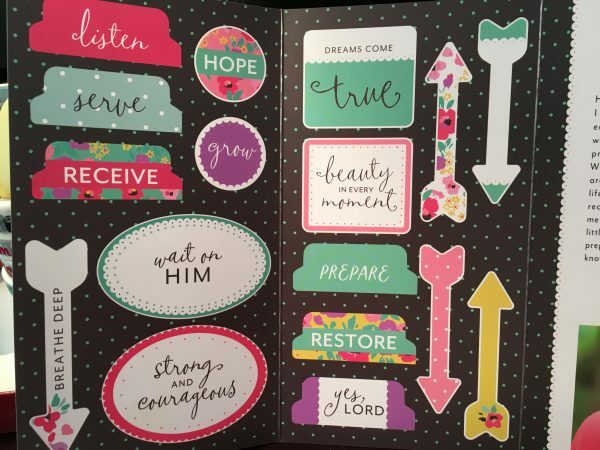 Stamps from the DaySpring “A Heart That Receives” Illustrated Faith devotional kit. Click the image to visit the Illustrated Faith store. First, He talked to me about receiving by covenant. We tend to think that we have to work for everything. I’m all for hard work; it’s Scriptural. You and I could probably both quote Bible verses all day about stewardship, faithfulness, diligence, and the value of dedicated service. But it’s not all about work. This is hard for me sometimes. It can be hard because we know for sure that some things, like salvation, are only available to us by grace. We know that Holy Spirit is given to us by grace. Those are gifts from God, purchased by the blood of Jesus, that we could never work for or earn. But there are other things that we can obtain by working. Meditating on receiving my children by grace, out of Isaiah 49 and 50. Isaiah 50 is also an amazing passage about receiving help from God! Click the image to visit the Illustrated Faith store. 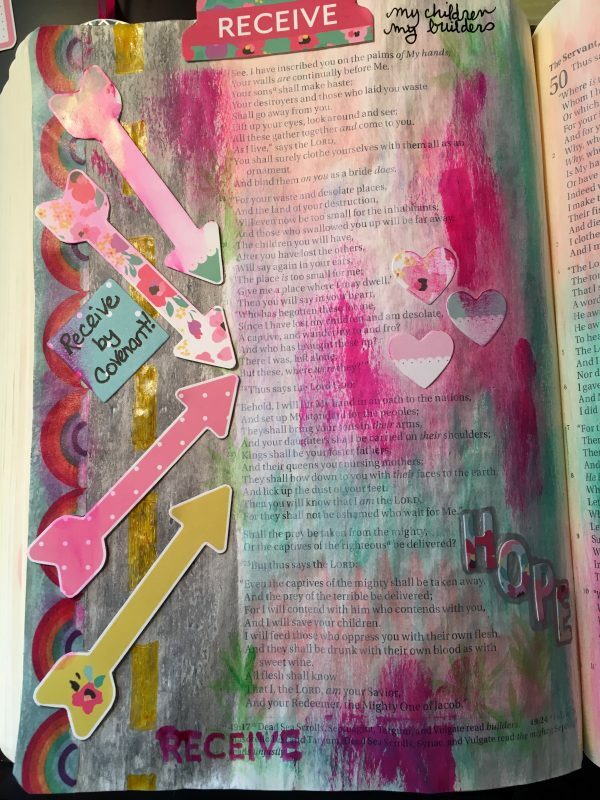 Everything on these pages is Illustrated Faith except the silver letters and the pink frame, which are from JoAnn. For example, health. Eat right and exercise, and you’ll be miles ahead in health. Money … lots of people work hard and receive lots of money in exchange. Things like that are things that you can indeed sweat for, and you can usually obtain them by your sweat. But Father is teaching me that there’s a higher way. Oh, we still have to be faithful. We still have to obey His voice and be diligent. The one truth does not negate the other truth. But you know what? It’s the MOTIVES and thought pattern behind our work that we sometimes need to get straight. At least I do, anyway. … And that God gives us things–health, provision, relationships, and so on–by His grace. It’s not Father’s will for us to think we have to make our own way in the world through the sweat of our brow. Or to think that we can bring ourselves into our own destinies by our own sweat. We can and should work and obey His voice, doing whatever He tells us to do. We can and should and must be faithful stewards and diligent servants. … Because the only thing that brings results is God, coming up under us and working through our situations, and bringing the fruit. And He does it all by grace. All by the blood of Jesus. I’m in tears writing this. I’ve been in tears studying it. And I’ve been in tears all morning drawing it. Why? Because I’m believing God for my children, and He will give them to me by grace. By His promise. By covenant. By virtue of His Word. And every day, I believe God to hide me and keep me safe under the shadow of His wings. This world is too much for me. I can’t handle it. I’m incredibly sensitive and I feel incredibly fragile and hiding under Daddy’s wings is the only thing that keeps me alive. But I can receive the comfort and safety and reassurance and hiding-away-from-everything that I need, under His wings, by grace. When I’m under His wings–a place Papa allows me to be by grace, through the blood of Jesus, He will defend me. He’ll defend me from the onslaught of the world. He’ll defend me from enemy attacks. He’ll protect me and protect my heart … my oh-so-fragile heart. And His words give me hope. I don’t have to earn it, and neither do you. I can rest. I don’t have to strive. I can rest, and obey, and receive. By grace. And so can you. What are you believing God for today? What do you need to relax about, and just RECEIVE? I know there’s something, or Holy Spirit wouldn’t have compelled me to share these things, which are very personal, with you. Is it a job? Finances? Health? Healing? Provision? Relationships? Whatever you need, if you have made Jesus the Lord and Boss of your life, you have access to your answer by grace. By the gift of God. By intimacy with Him through Christ Jesus. So do you need to sit down and pray and just RECEIVE today? If so, I pray you would. I encourage you to present your heart to the Lord. Pour out all the deepest thoughts and passions of your heart to Him. Ask Him for His help. Point to His Word and insist that He do what He said He would in that word, just because He said. By virtue of His grace. By the covenant of His promises. Did you pray this prayer with me? If so, did you sense Holy Spirit ministering to you and strengthening you while you prayed? Leave a comment below if so! Jamie, Be bless today. I thank you for all your encouraging words. This Word was my devotion today. My concern, my prayer, my answer to prayer by virtue of your testimony as well. My list is all of the concerns you listed of which I have tried to work for apart from Salvation. But it is definitely been an answer as to why I have found myself at this place of loss but now great gain. Today his word took me back to covenant relationship with Abraham. Then the importance of having faith to simply ask believe and receive. I found it hard to even not doubt because my need seemed too much to ask God for. The question was would I allow him to give me faith over doubt to receive. You confessing my lack of faith. Then embracing his divine provision which is limitless! Simply because He the order God of all flesh and the question was posed in Jeremiah 32:27 b “is there anything too hard for me”? And I had to answer that question. I could not until I was led to covenant promise and his faithfulness to his chosen. Without a doubt I can now believe and trust that it has nothing to do with what I can do but what he alone is able to do based on his Word which cannot lie. Hallelujah what an awesome God! Only he can do such wonders and then today speak that same word of promise to help us receive by faith through grace his riches he has prepared for those who love him. He knows, He cares, he has this Jamie all of it and some more! Blessings to you for sharing with us your heart today. It truly has confirmed his provision in helping to stabilize my faith. God bless you! Love and prayers. Thank you, dear sister. Much love and big hugs to you today. Thank you, Jamie. I cry with you. I had texted my lovely step daughter less than 10 minutes ago telling her to claim God’s Promises as His children. Your words were a confirmation to doing just that. Pray to God for His will for us. Yes, Pray and Receive. That is so awesome. Papa is so GOOD. Thank you for letting me know. Thank You, Jesus. What bible do you journal in? 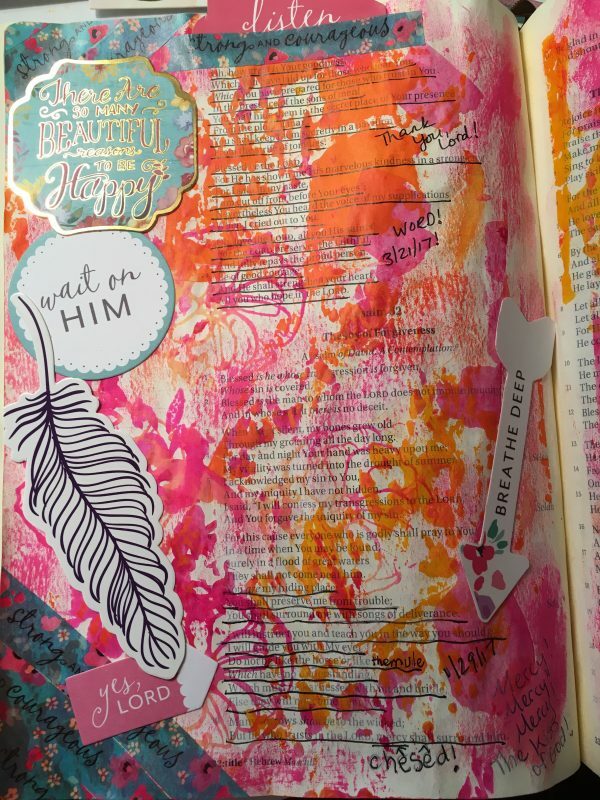 Love your showing these kits every month and the pages in your bible you have done! Hi Sondra! 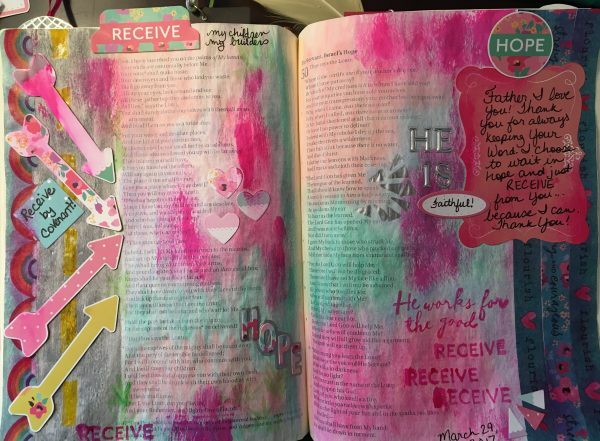 I use this Bible here: https://www.fromhispresence.com/my-10-favorite-bible-journaling-supplies/ and I absolutely love it. Thanks for the encouragement! 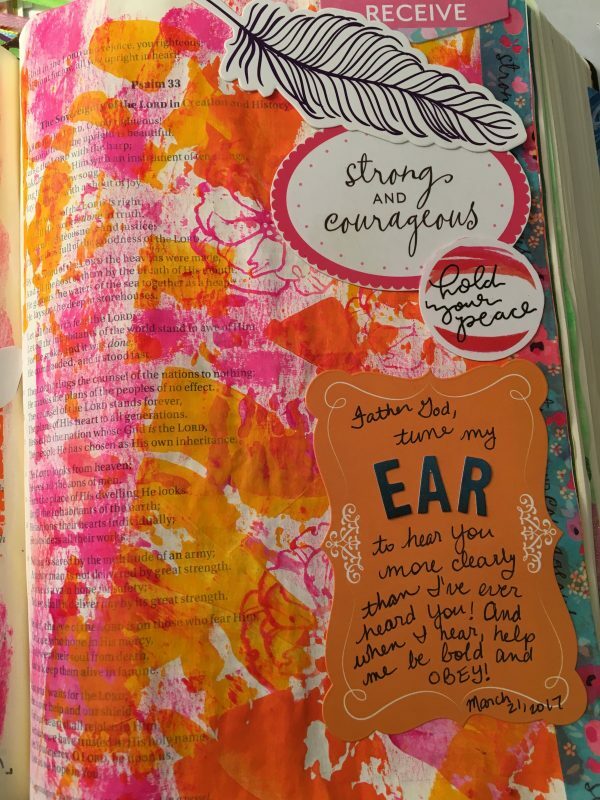 Doing art journaling helps me so much. I don’t do it every day, but as often as I can. It helps me get the Word in my spirit and heart deeper! I let my heart get broken, so instead of me guarding it, OT, the peace of God has to, NT. There are some thing we cannot do and must hide on or secret place or prayer closet. He is very near to us with our tears and sensitivity and the world and even fellow believers may no understand. I’m so sorry that that happened, dear sister. I pray Papa would heal your heart abundantly, so that it is better than ever before and that it is healed so thoroughly that there is not even a scar. I don’t have a written prayer for this right now, sis, but I will try to keep that in mind for future blog posts. But you don’t have to speak any particular words, dear. Just ask Holy Spirit to help you pray, and then pour out your heart to Him. All He wants to hear is your prayer of faith. Amen. Psalm 84:11 is one of my favorites. He would never, ever, ever withhold good from us. Thank You, Lord Jesus! Amen! This is a true revelation of my outspoken word. We might have worked day and night, but still only GOD make it happen or come true. Even the slightest thought of embarking on a mission comes from Him. It only He had breathed on it that we see it succeed. Amen. Very true. Thank you for sharing! Good morning, sometimes it’s hard for us to receive when we are always in a posture to give. Open your hand, your heart,your mind to receive. Be open to all the blessings that God has in store for you, most people don’t want to take from you nor do they have hidden agendas. There’s still some genuine, pure hearted people. Be open to receive! These are the words I wrote to a friend after reading about receiving. I believe I was also speaking to myself thanks for the encouragement! Wonderful words. Thank you for sharing! I have no memory of where or how I signed up for your emails. The first one I received in my inbox gave me surprise and I was perplexed yet drawn in by the title. The first one I read felt like a specific encouragement from the Lord for me so maybe Father God signed me up. This article today and many since have blessed me abundantly. Thank you for all the encouragement and hope ! Thanks for reading, Cheryl! I am thrilled to hear that Father encouraged your heart. May His grace, love, and peace wash over you in wave after wave today, in Jesus’ name! Yes this speaks to me today. It came in my email the other day but came again today and this time I took time to read it. What a blessing! So glad it blessed you, Sharon. May Papa give you grace and courage to rest and receive all His goodness today, in Jesus’ name! Jamie the Lord bless you for giving you strength and energy to feed us with powerful words and inspirations. The journaling will be helpful to have some words in remembrance in times of worry etc. I pray for grace to have this gift of remembering the correct quotations in times of hardships etc. It’s very helpful indeed, Freda. Have you tried it? 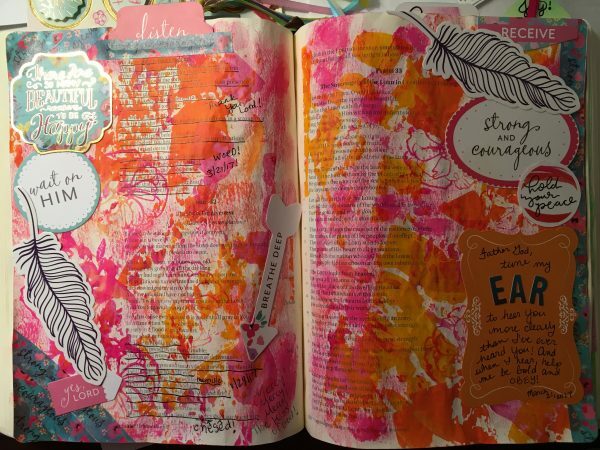 Holy Spirit speaks often in pictures, so adding color and art to our pages brings us further into His language! Jamie, I’m grateful God allowed us to cross paths. Jesus was so clear to me with Pray to Lose the weight. I had first thought it was only body weight, but it is so much more bigger than that. It’s laying aside the weight of life, which helps us with all weight. 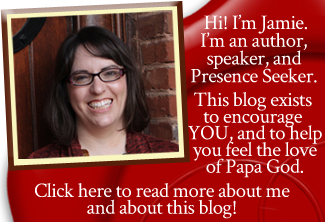 Reading your blog gave me more confirmation than I can articulate. You have a special relationship with with Jesus. Thank you for your encouragement, truth, vulnerability, and transparency. I’m glad too, sis. I’m thoroughly enjoying the Pray to Lose program! The revelation alone the Lord has been giving me is worth sooo much more than the minimal cost of the program. I thank God for you and your revelation, sister! You are truly anointed to pray! Jamie, you never cease to find a way to let the Lord feed my soul! I have been struggling for months now. I had knee surgery in September. I have very bad arthritis and can’t ever return to the job I was doing. I have some disability I’m entitled to from my work, but 3 doctors have said they won’t sign the paper for it to start. So. right now I have no income. And things are getting very hard and tight for me. When I pray I feel the Lord tell me to rest in Him. And I have rested and trusted and prayed. But this huge boulder won’t budge of these doctors refusing to sign for what I’m entitled to. So, after reading this today….I’m standing strong! I believe the Lord my God..under whose wing I abide and who promised is my Shepherd is going to work out my situation! glory to God! Please agree with me! Amen!! I prayed for you, sister. Hang in there! And ask Papa to show Himself to you and manifest Himself as your Ever-Present Help in trouble! Thank you Jamie for always speaking exactly what I need. The Holy Spirit is so faithful as He ministers to the very depth of our hearts. Thank you for your sensitivity and for ministering in His love and mercy. Thank you! Thank you, sis. I so appreciate you! If you believe that He won’t give you what you ask for, then you’re right, friend. But if you believe He will, then you’re also right. James 1:5-7.